As embryonic and cancer cells present similarities of behavior and phenotype, differentiation therapy with embryo cell extracts has been considered. -with Zebrafish embryo proteins on human colon cancer cells and hepatocellular carcinoma. Interesting results have been obtained: inhibition of DNA synthesis and proliferation of cancer cells, without toxic effect, apoptosis. Various chemical and biochemical differentiation compounds have been shown to revert to normal state several kinds of cancer cells. As embryonic and cancer cells present similarities of behavior and phenotypes and as regulatory factors in young embryos have been displayed, a treatment of cancer cells is proposed by extracts of rat and mouse embryo cell nuclei.10-20 day old rat and mouse embryo nuclei were prepared by the method of Widnell and Tata. The separation of the nuclei extracts was performed by high performance liquid chromatography on an anion exchange column.The activity tested of the fractions was the 3H thymidine incorporation by LFCl2A, an established cell line from a hepatocarcinoma and by Raji, a B cell line at the stage blast 1 from a Burkitt lymphomaThese extracts were not cytotoxic and inhibited, up to 90%, DNA synthesis of LFCl2 A. 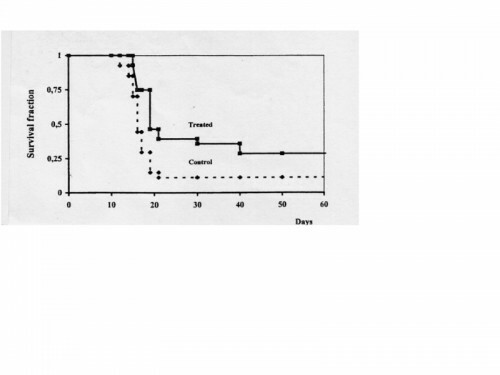 They prolonged the survival time of rats injected with LFCl2A and increased the percentage of survivors at one month. As these factors were not cytotoxic and were active at low concentration, they could be used repeatedly on the remaining cancer cells, after surgery, radiotherapy or chemotherapy. In the same way, the inhibitory and apoptotic effects of Zebrafish embryo proteins on colon cancer cells and hepatocellular carcinoma have been reported by italian researchers. Cancer cells. Differentiation therapy. Embryonic nuclear proteins.